"Bourne 2" redirects here. For the novel, see The Bourne Supremacy. The Bourne Supremacy is a 2004 American-German action thriller film featuring Robert Ludlum's Jason Bourne character. Though it takes the name of the second Bourne novel, its plot is entirely different. The film was directed by Paul Greengrass from a screenplay by Tony Gilroy. Universal Pictures released the film to theaters in the United States on July 23, 2004. It is the second in the Jason Bourne film series. It is preceded by The Bourne Identity (2002) and followed by The Bourne Ultimatum (2007), The Bourne Legacy (2012), and Jason Bourne (2016). Two years after their disappearance, Jason Bourne and Marie Kreutz are in Goa, India. Still experiencing flashbacks about his life as a CIA assassin, he records them in a notebook. In Berlin, a CIA agent working for Deputy Director Pamela Landy is paying $3 million to an unnamed Russian source for the "Neski files", documents on the theft of $20 million seven years prior. The deal is interrupted by Kirill, an agent for Russia's Federal Security Service who works for oligarch Yuri Gretkov. First Kirill plants two explosive devices on the building's electrical circuit. One takes out the power to the building, the other does not go off but has Bourne's fingerprints planted on it, using a transparent adhesive film, in order to frame him. Kirill kills the agent and the source and steals the files and money. Gretkov directs Kirill to Goa to kill Bourne; however, Bourne spots him at the market and on the beach and flees with Marie in a Jeep. Kirill follows in a car chase and kills Marie instead of Bourne, unaware Marie and Bourne had swapped seats in the vehicle. Their Jeep plunges into a river, yet Bourne escapes the crash having let Marie drift away underwater. Kirill looking from the bridge is convinced that Bourne is dead since he did not surface from the water. Bourne then leaves Goa and travels to Naples. After finding Bourne's fingerprint, Landy asks Deputy Director Ward Abbott about Operation Treadstone, the defunct CIA program to which Bourne belonged. She tells Abbott that the CIA agent who stole the $20 million was named in the Neski files. Some years previously, Russian politician Vladimir Neski was about to identify the thief when he was killed by his wife in a suspected murder–suicide in a Berlin hotel. Landy believes that Bourne and Treadstone's late supervisor, Alexander Conklin, were somehow involved and that Bourne killed the Neskis. Both Abbott and Landy go to Berlin to capture Bourne. In Naples, Bourne allows himself to be identified by security. He subdues his CIA interrogator and copies the SIM card from his cell phone. From the subsequent phone call, he learns about Landy and the frameup. Bourne goes to Munich to visit Jarda, the only other remaining Treadstone operative. Jarda informs Bourne that Treadstone was shut down after Conklin's death, and tries to incapacitate him. Bourne kills Jarda in self-defense and escapes before the CIA arrives. Bourne follows Landy and Abbott as they meet former Treadstone support technician Nicky Parsons to question her about Bourne. Believing that the CIA is hunting him again, Bourne calls Landy from a nearby roof and is told of the reason for his pursuit. He demands a meet-up with Nicky and indicates to Landy that he can see her in the office, shocking the entire CIA team. Bourne kidnaps Nicky at the meet-up in Alexanderplatz and learns from her that Abbott was the head of Treadstone, not Conklin. Bourne spares Nicky after revealing she knows nothing about the mission since it was not officially documented. Bourne then visits the hotel where the killing took place and recalls more of his mission—he killed Neski on Conklin's orders, and when Neski's wife showed up, he shot her to make it look like a murder–suicide. Danny Zorn, Conklin's former assistant, finds inconsistencies with the report of Bourne's involvement with the death of the agent, explains his theory to Abbott by indicating Bourne's fingerprint that were on the bomb had not gone off. Abbott kills Zorn to prevent him from informing Landy. Bourne breaks into Abbott's hotel room and records a conversation between him and Gretkov that incriminates them in the theft of the $20 million. Abbott admits to Bourne that he stole the money, ordered Bourne to murder Neski, ordered Kirill to retrieve the files, and have Bourne framed and silenced in Goa. Abbott expects Bourne to kill him, but Bourne refuses, believing Marie's wishes not to kill, but leaves his gun on the table. After Bourne leaves, Landy confronts Abbott about her suspicions and he commits suicide. Later, Landy returns to her hotel room where she finds an envelope containing the tape of Abbott's conversations with Gretkov and Bourne. Listening to the tape, she realizes that Bourne is now vindicated. Bourne travels to Moscow by train to find Vladimir Neski's daughter, Irena. Kirill, tasked once again by Gretkov with killing Bourne, finds and wounds him. Bourne flees in a stolen taxi and Kirill chases him. After a long high-speed chase, Bourne forces Kirill's vehicle into a concrete divider. Bourne walks away, leaving a seriously wounded Kirill. Gretkov is subsequently arrested. Bourne locates Irena and confesses to murdering her parents; after apologizing, he leaves. Later in New York, Bourne calls Landy; she thanks him for the tape, reveals to him his original name, David Webb, and date of birth, and asks him to meet her. Bourne says, "Get some rest, Pam. You look tired." Matt Damon as Jason Bourne: An amnesiac and former assassin of the CIA's Operation Treadstone. Joan Allen as Pamela Landy: A CIA Deputy Director and Task Force Chief, pursues Bourne after her operation goes badly. Brian Cox as Ward Abbott: A CIA Deputy Director formerly in charge of Treadstone. Julia Stiles as Nicky Parsons: Formerly Bourne's Treadstone contact; she is taken from her post-Treadstone assigment to assist in the search for Bourne. Marton Csokas as Jarda: A former Treadstone operative based out of Munich. Karl Urban as Kirill: A Russian secret service agent and an expert assassin who is working for Gretkov. Karel Roden as Gretkov: Kirill's employer. Franka Potente as Marie Helena Kreutz: Bourne's girlfriend. Gabriel Mann as Danny Zorn: Formerly assigned to Treadstone headquarters, is now on Abbott's staff. Tomas Arana as Martin Marshall: CIA Director. Tom Gallop as Tom Cronin: Landy's righthand agent. Michelle Monaghan as Kim: Landy's number two agent. Oksana Akinshina as Irena Neski: Daughter of politician Vladimir Neski, whom Bourne killed. There were no plans to make a sequel to The Bourne Identity (2002) when it was conceived. Matt Damon commented, "When The Bourne Identity came out I said, 'There is very little chance we will do a second film, just because nobody on the team who made the first wants to make another movie if it can't be as good as, or better than, the first one.'" According to producer Frank Marshall, the plot for the sequel was not based on the novel The Bourne Supremacy but also by Bourne's threat in the first film to come after the CIA if it targeted him. Producer Paul L. Sandberg felt that screenwriter Tony Gilroy's deviating so much from the book was necessary "because so much of the world has changed" since 1986, when the sequel was first published. Marshall said that Gilroy thought of an idea that Bourne "would go on what amounts to the samurai's journey, this journey of atonement." The producers replaced Doug Liman, who directed The Bourne Identity. This was mainly due to the difficulties Liman had with the studio when making the first film, and their unwillingness to work with him again. British director Paul Greengrass was selected to direct the film after the producers saw Bloody Sunday (2002), Greengrass' depiction of the Bloody Sunday shootings in Northern Ireland, at Gilroy's suggestion. Producer Patrick Crowley liked Greengrass' "sense of the camera as participatory viewer", a visual style Crowley thought would work well for The Bourne Supremacy. The film was shot in reverse order of its settings: some portions of the car chase and the film's ending were shot in Moscow, then most of the rest of the film was shot in and around Berlin, and the opening scenes in Goa were filmed last. According to a June 2008 article from The Guardian, "Two weeks before [the film's] release, [Greengrass] got together with its star, Matt Damon, came up with a new ending and phoned the producers saying the new idea was way better. And it would cost $200,000 and involve pulling Damon from the set of Ocean's Twelve for a re-shoot. Reluctantly the producers agreed—the movie tested 10 points higher with the new ending". The Bourne Supremacy brought in over $52,521,865 on its opening weekend, putting it at No. 1 for the weekend box office (July 23–25, 2004). The film went to gross over $176,241,941 (61.1%) in North America, with the international release being $112,258,276 (38.9%) resulting in a complete total of $288,500,217 worldwide. The film received positive reviews from critics. Review aggregation website Rotten Tomatoes gives the film a score of 81% based on reviews from 189 critics, with an average score of 7.2/10. The site's consensus reads "A well-made sequel that delivers the thrills." At Metacritic, which assigns a normalised rating out of 100 based on individual reviews, the film achieved an average of 73 based on 39 reviews, indicating "generally favorable reviews". At the 2005 Taurus World Stunt Awards, veteran Russian stunt coordinator Viktor Ivanov and Scottish stunt driver Gillie McKenzie won the "Best Vehicle" award for their driving in the Moscow car chase scene. Dan Bradley, the film's second unit director won the overall award for stunt coordinator. The film ranks 454th on Empire magazine's 2008 list of the 500 greatest movies of all time. ^ "The Bourne Supremacy". British Film Institute. London. Retrieved September 30, 2012. ^ a b c "The Bourne Supremacy (2004)". Box Office Mojo. Amazon.com. Retrieved August 6, 2007. ^ Bennett, Bruce (May 28, 2008). "Jason Bourne Takes His Case to MoMA". NYSun.com. Retrieved September 10, 2009. ^ "Picking Up the Thread". Production notes. The Bourne Supremacy (2004). Retrieved 2010-07-16. ^ "Setting Bourne's World". Production notes. The Bourne Supremacy (2004). Retrieved 2010-07-16. ^ "'The Bourne Supremacy' Production Notes". MadeinAtlantis.com. Retrieved 2011-11-09. ^ Armstrong, Stephen (June 8, 2008). "A whirlwind in action". The Guardian. Retrieved August 20, 2012. ^ "Weekend Box Office Results for July 23-25, 2004 - Box Office Mojo". www.boxofficemojo.com. Retrieved August 17, 2018. ^ "The Bourne Supremacy". rottentomatoes.com. Retrieved August 17, 2018. ^ "The Bourne Supremacy". metacritic.com. Retrieved August 17, 2018. ^ "2007 Taurus World Stunt Awards". TaurusWorldStundAwards.com. Retrieved 2011-11-09. ^ "Empire Features". EmpireOnline.com. Retrieved 2010-08-24. 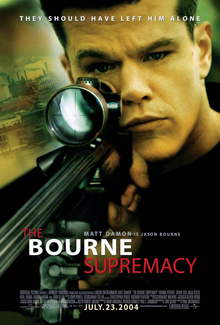 ^ a b c d e f g h i j k l m n o p "The Bourne Supremacy (2004) – Awards". IMDb. Amazon.com. Retrieved August 24, 2007.